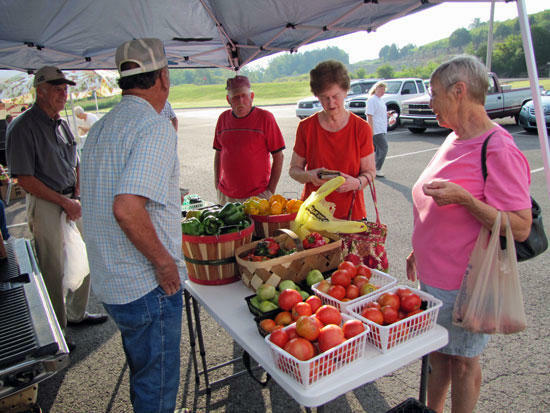 Local produce such as those sold at the Cannon County Farmer's Market are making their way to the tables of Cannon County Schools. This fall, Cannon County schools cafeterias are meeting tough new federal nutrition standards for schools meals, ensuring that meals are healthy and well balanced and provide students all the nutrition they need to succeed at schools. Improving child nutrition is the focal point of the Healthy, Hunger-Free Kids Act of 2010. The legislation authorizes funding and sets policy for USDA’s core nutrition programs. This includes the National School Lunch Program. The Healthy, Hunger-Free Kids Act allows USDA the opportunity to make real reforms to the school lunch program. Now that the new federal standards for school nutrition have been announced, more students are piling their lunch trays with healthy fruits and vegetables, hearty whole grains, and better-for-you versions of their favorite meals. School meals offer students milk, fruit, vegetables, proteins and grains. Meals meet strict limits on saturated fats and portion size. Starting in school year 2012-2013, school lunches will meet additional standards requiring, age appropriate calorie limits. Larger servings of vegetables and fruits will be offered to students daily. Students will be encouraged to take at least one serving of fruit or vegetable. A wider variety of vegetables will also be offered, including dark green and red/orange vegetables and legumes (dried beans). Lastly more whole grains will be offered to students. August 27-31st is Local Foods for Local Schools week. Schools are encouraged to menu at least one local produce item during this week. Cannon County School Nutrition has accepted this challenge; with the help of the local UT Extension Agent we have contacted a local farmer to provide fresh local grown tomatoes in selected schools during this week. Students at Woodbury Grammar, West Side School and Cannon County High School will enjoy local grown tomatoes on their salads, hamburgers and sandwiches. We plan to serve other local grown produce at the counties 4 other schools in upcoming weeks. Now is a great time to encourage your kids to choose school lunch!